This Worksharp accessory kit features 5 fine abrasive replacement belts designed to work with the Ken Onion Edition Knife and Tool Sharpener. 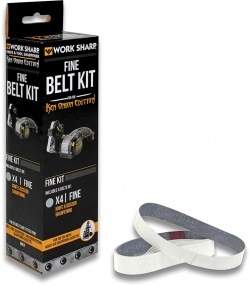 The belts are made from long lasting abrasives that wear evenly and offer cool grinding that resists heat transferring. The X4 includes 5 fine abrasive belts that measure 3/4" x 12".